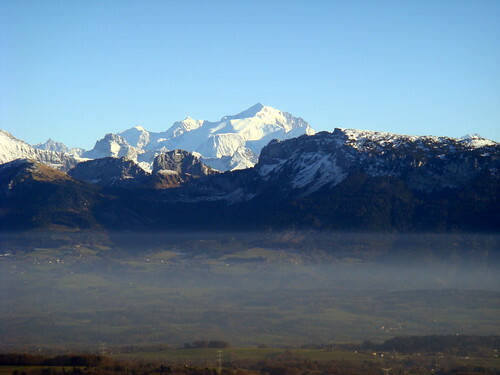 Le Salève is the massif overlooking Geneva just to the south of the city. There are five road bike routes up this mountain. All interesting, and some very challenging. 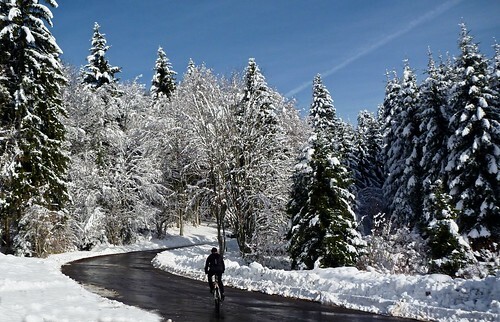 I cycle up Le Salève often – especially in winter. It’s possible to ride several kilometres along the top, with great views of lake Geneva on one side, and the Alps on the other. It’s a great place to cycle. 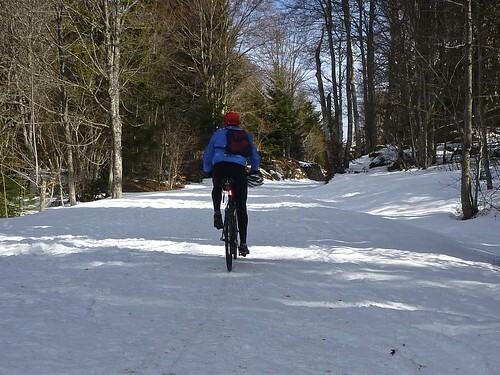 Here is another post discussing several mountain bike routes up Mont Salève. I have put all the routes plus key locations on the map at the very bottom. I have all five routes ending at the Orientation table (15 second hike above the road) — a couple of kilometres above Col de la Croisette. At 1300 metres, this is one of the two high points up Le Salève. The other high point is near Col des Pitons at 1340 metres (again see map). 1. North-West side – STEEP!! This side is short but hard. There aren’t many paved 4km stretches any where that are steeper than the middle 4 kms here — averaging around 12% — with lots of stretches far steeper. There are 7 or 8 absolutely beautiful hairpins as the road winds straight up. We watched the pros fly up this during the Dauphiné in 2008. This is the side I climb most often – and probably the quietest side. 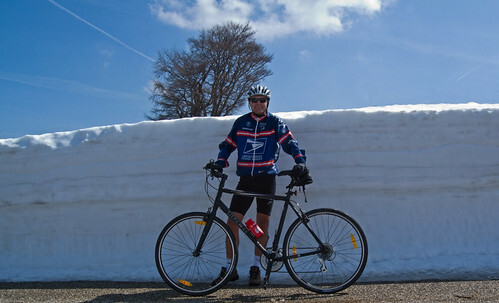 I have started the route at Mont Sion, but it can take quite an effort just to get there. 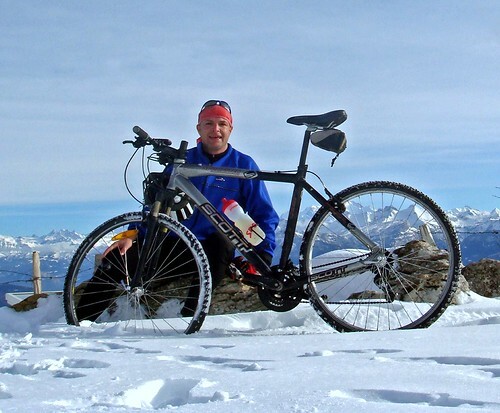 Tip: Approach the Mont Sion via Col de la Croix Biche and Charly – avoiding the very buys D1201. The first few kms up to Château des Avenières are steep but fun. After a short descent from the château, the route turns up through the woods. This is a lovely, less steep stretch – on windy roads …. with the occasional group of deer running past. 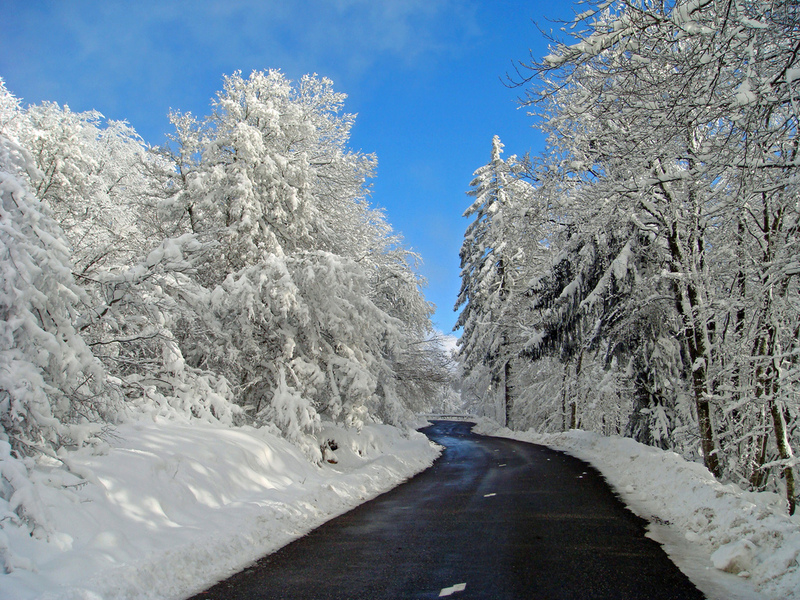 After seven kilometres along this route, the road is closed for several months during winter all the way to Croisette. But we frequently take our bikes over anyway. 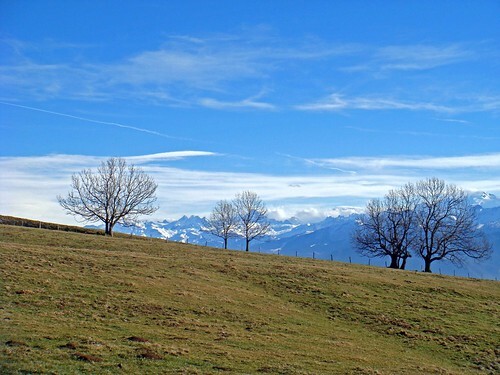 Often in autumn and winter Geneva is covered with low, grey clouds. 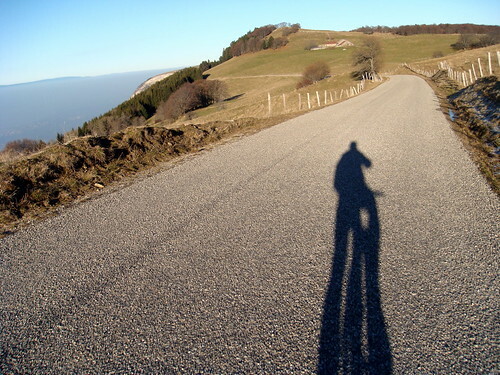 But it can sometimes be easy to get above the clouds into bright sunshine just by cycling up Le Salève. It’s hard to believe in the photo below, but it’s a dark, grey depressing day in Geneva under those clouds. Just for the sake of completeness, this is just the more normal variation of route #2. Starting from Cruseilles it’s a consistently gentle climb through the woods that joins the route from Col du Mont Sion after about 5 kilometres. 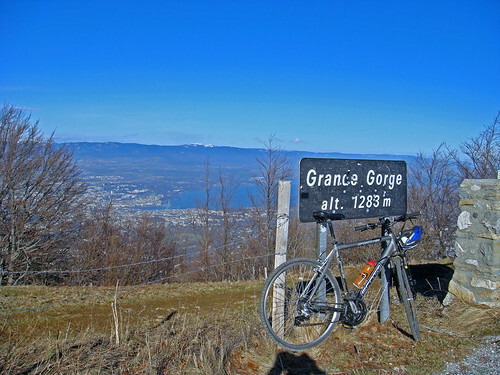 Starting near Annemasse, this side starts at the lowest altitude. The first couple kilometres can have a little bit of traffic … but the road soon becomes fairly quiet. In the middle, after Monnetier-Mornex are some very steep stretches and a couple of good look-out points down to Geneva and the lake. It becomes less steep as you pass the cable car station and pass the Grande Gorge. Not the easiest side …. but probably my least favourite. I don’t do this side very often. But it’s a perfect way to “return” to Geneva after visiting some of the smaller Cols on the other side of Le Salève like Col le Parc. For example see the map in this link. Excellent article ! J’en avais fait un similaire pour le Mt Thou, le “Mt Salève Lyonnais” (ok pas aussi haut et dur, but very nice too ! ), et j’aimerais en faire un autre cette année sur le Mt Verdun (là où je vais le plus souvent). Je n’ai fait que le versant nord pour le Salève, avec des sacoches: difficile, assez long, belle montée… Je suis redescendu par la face nord-est, la pente est assez impressionnante ! Bastien, il faut essayer le versant depuis Col du Mont Sion …. parce qu’on peut faire plusieurs kms en haut avec des belles vues. Superbe. Route 1 confused me to begin with … until I realised it was in fact the North-West side. But you are right, Will, the Salève is a rather special mountain. Did you know that Frankenstein’s monster hid amongst the trees and crags after escaping across the border from Switzerland? Oops, Thanks David, I made a typo on route one. Indeed the North West side. Hi Will, I have been following your exploits on the bike for a while and can only join an ever growing choir of admirers. It’s been very inspiring and moving to read about your own journey on a bike. I am certain your preparation for L’Etape is going well. Could you recommend a cyclable route to Mont Saleve/Annecy avoiding traffic as much as possible? How realistic is to cycle from Geneve to Cluses/Taninges/Samoens area avoiding busy roads? Finally, could you recommend a bike shop/mechanic in Geneve? 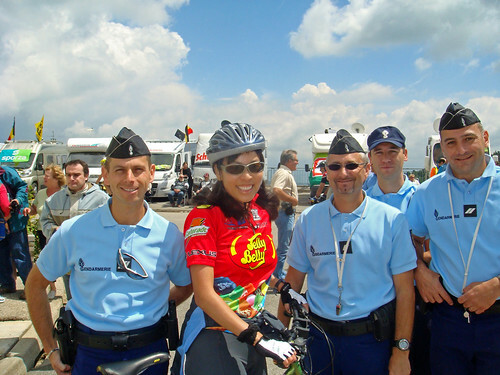 Thanks again for your posts and success in building up to L’etape de Tour! I have sent you some info via email that I hope helps. Can’t thank you enough for your site Will. 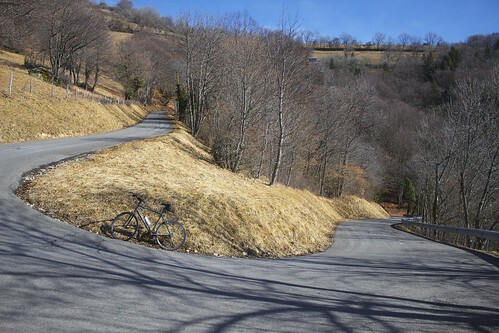 Posted a while back to say I live below Col de faucille and have used your site to discover the many quieter Cols on the Jura. Now making the most of your Saleve guides. 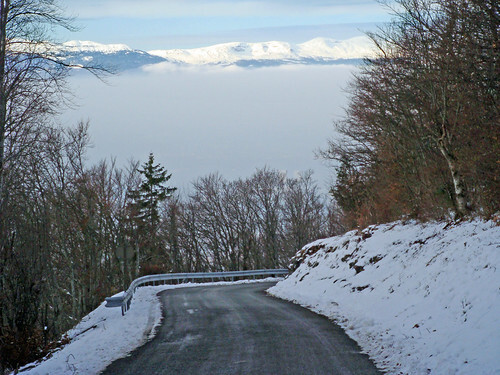 Every route up the Saleve is so beautiful, peaceful, and the top is wonderfully deserted with fabulous views. Am training for Alpenbrevet have read your piece on that. I don’t know if you’re seriously injured or enjoying a break from cycling or both but thanks and hope you’re back on a bike asap. Great guide, thanks! Did the North West side tonight and it’s definitely the most brutal thing I’ve ever done on a bike. What a descent though! Your site is excellent, Will!!! 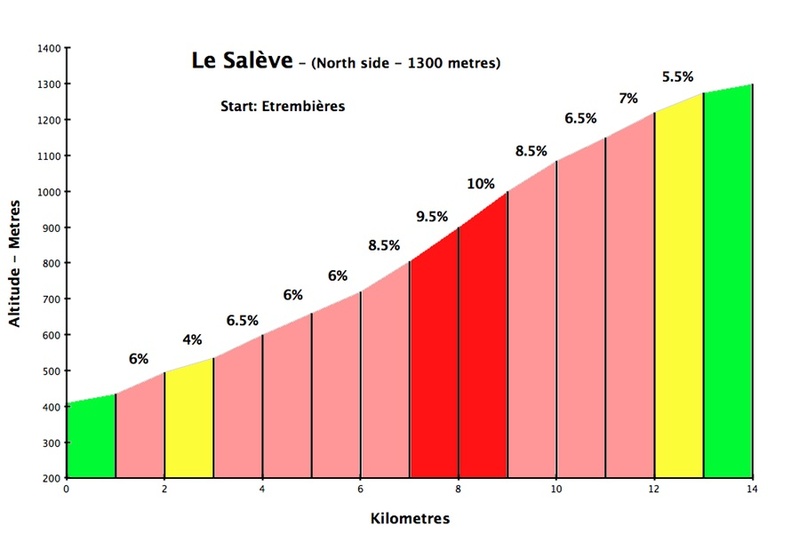 I climbed the Salève yesterday for the first time (my first “serious” climb). Your information was extremely valuable. I had tried the North side on Saturday, but I had to turn back a bit before the cable car (ran out of time and talent). Since I’m in not very good shape, I tried a less tiresome route. I went from Veyrier to Étrembières and from there to Muraz, and then on to the orientation table. It was quite a big deal for me. Nice articles. I will either be cycling up le Saléve or or around lac leman on saturday. Not sure which yet. Looking forward to it but fear it will be hard work on my girlfriends Dads old push iron. It weighs a ton and has no compact gears. Oh well, I can always push. So far I only climbed Mt. Saleve from Mt. 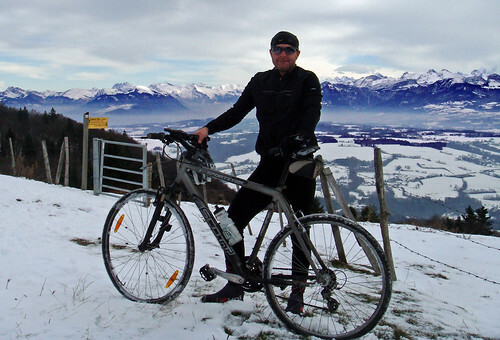 Sion (#2) on my road bike and a few times by MTB through the woods, but may attempt #1 from Collonges-sous-Saleve soon. 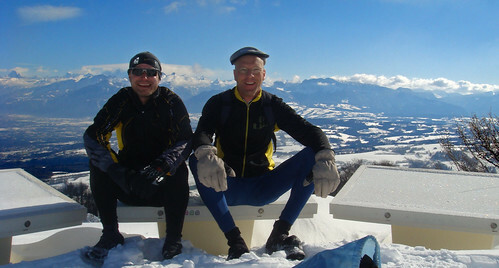 I once had a beer under the Salève with A friend, James, a very strong cyclist. His idea was to start a web site for the Salève similar to the Grand Colombier brotherhood. I suppose Salève is a little strange as there are sort of two summits. Col des Pitons, and the lookout to the north and above Col de la Croisette. (We never did get around to making the web site). No, I have never climbed all 5 sides in one ride. But the Le Coin Side and the Annemasse sides are very hard work. It would be a fun achievement. Hi. I am away at the moment. But on Tuesday I will map you the most scenic wa from downtown Geneva. 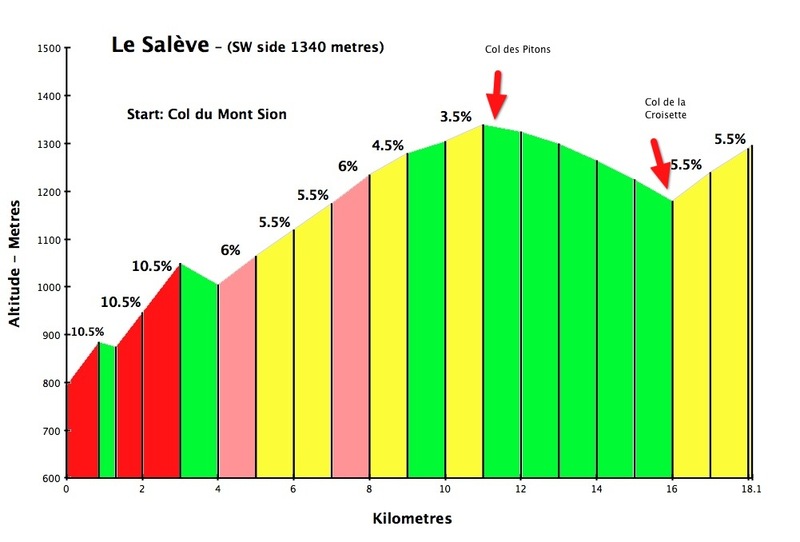 See this link for a suggested route from Cornavin station in downtown Geneva to Col du Mont Sion and then up Le Salève. Note, from the station you will also see National Route #1 cycling signs to Chancy, which is the far west village in Switzerland. You could follow this for a far less direct, but quiet, scenic way and then join my route near Chancy. just before French border. There are more direct ways but my proposal is quiet once you get out of city and has bike lanes for much of it. Whatever you do, you want to avoid N201 (also called D1201) as a busy fast traffic road. Hi Will! Thanks so so much for posting this. It really helped me plan my unforgettable climb. 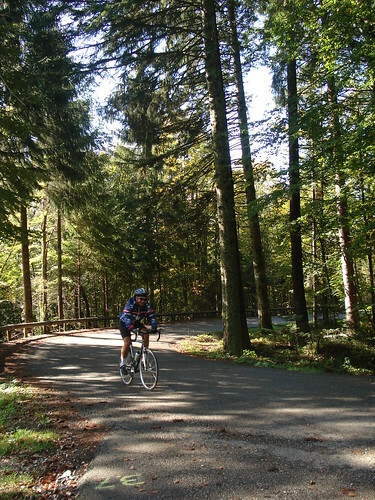 I LOVED biking through saleve and I don’t think I would have if it had not been for your clear and very helpful tips and instructions. Although I live in Geneva, I decided to bike to cruseilles and then ascend from there. I then biked along the d41a and descended from the north side. Glad your ride went well. Thanks for this great comprehensive post. 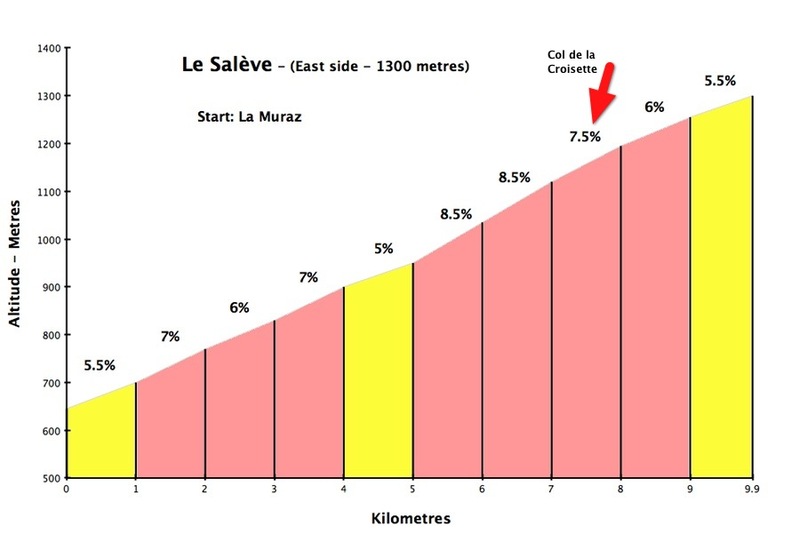 I have been musing about cycling up Salève since I got to Geneva a year and a half ago, but it looked a bit intimidating so I trained on slightly lower climbs in the meantime. 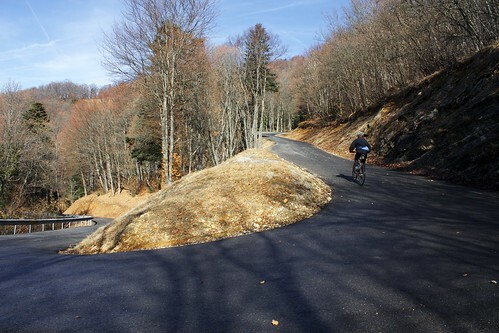 I cycled out of Geneva through Carouge and then climbed to St-Blaise and after a bit of road in the woods, joined the Cruseilles route to Col des Pitons (wonderfully smooth pavement!). Thanks again, looking forward do hitting it up again soon! Ewa, well done. Via St. Blaise is how I usually climb Le Salève. Always quiet, peaceful in the woods, and scenic up higher. Hi Will, I cannot thank you enough for this post. I am a total beginner and thanks to your inspiration I have done the North side several times (my first serious climb); yesterday evening I finally found the courage to try the North-West. I went up very slowly, but I am proud that I only took a 30-second break in the whole climb to catch my breath and drink. If I may ask, I would like your advice: if I have been able to do the North-West side without big problems, what other climbs can I try in the region? I am very tall and weigh over 100 kg, so not exactly a natural-born climber. 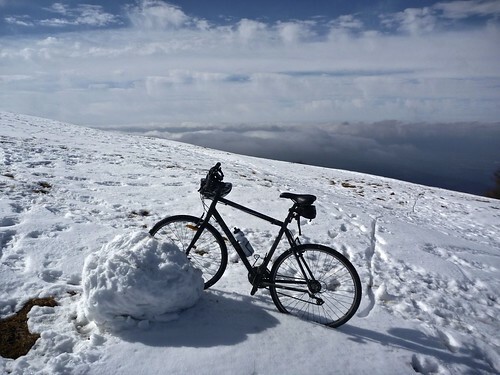 Do you think Alpe d’Huez or Col de la Madeleine are out my reach? 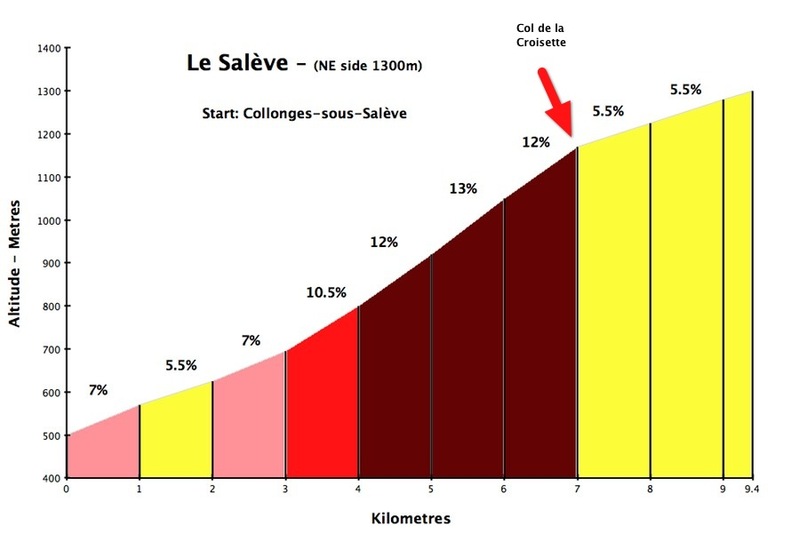 Or the hardest route up the Salève already qualifies me for the hardest climbs? A million thanks again. Jon, congratulations, very well done. 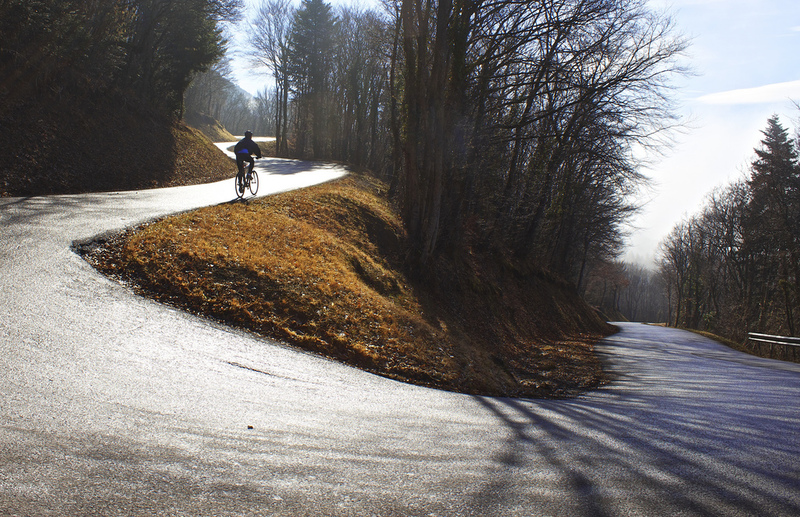 If you can turn the pedals up the north-west side of Mont Salève, then you should be able to manage almost anything. Of course, some of the huge climbs are much longer but that middle 4 km stretch that you successfully managed is about as tough as it gets. And if you have also made the longer, but still challenging north side of Salève several times then I am not worried for you. On even tougher stuff just make sure you have nice easy gearing (I use a triple!) and take your time. I don’t think you are too far from Alpe d’Huez (hard) or Madeleine (VERY hard). Went up from Etrembieres June 2014 the day before my 68th birthday! Loved it superb lunch on the way down below the cable car – I think? Thanks for posting these routes. I took the NortEast route today and had a blast. Thank you for your excellent bunch of information on your website. I just stumbled across it, looking for some useful information of the Mont Salève. 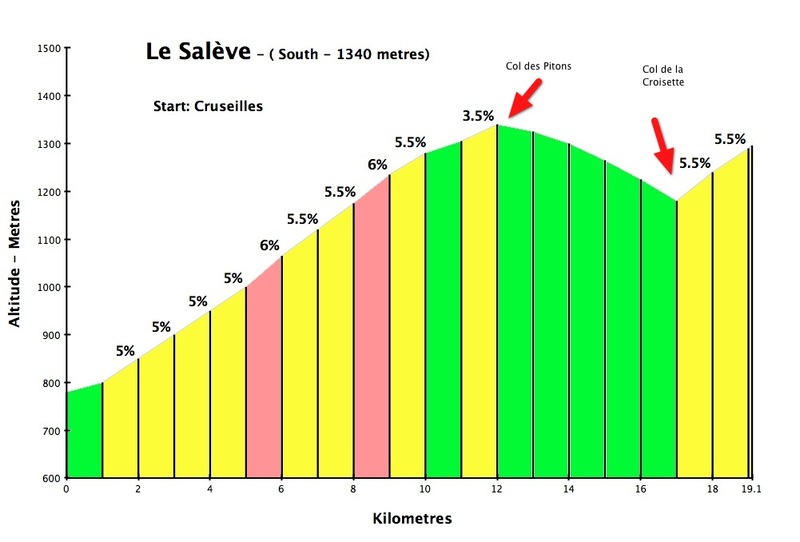 Can you or some people around here can suggest other routes in the vicinity of the Mt Salève? 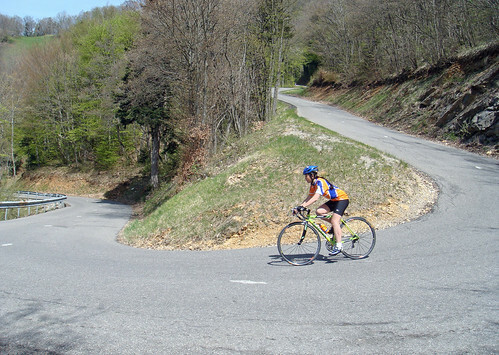 I want to do a loop towards Le Grand Bornand, doing the main climbs from the 10th TdF stage incl La Glieres.